Acton Elementary Hosts the Big Canyon Balloon! 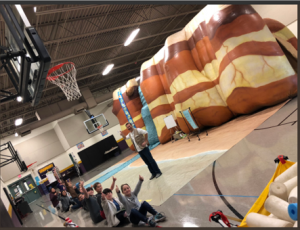 GRANBURY, TEXAS – Acton Elementary students spent a day with Rocky the Big Canyon Balloon, SparkPoint Innovations’ in-house geology experience. The 4th and 5th graders were well versed on slow changes already. These kids were great participants in discussions and had already knew and practiced the “break, move, drop song”. What a fun group of kids! Thanks for sharing your day weathering, eroding, and depositing with us – we loved sharing the secrets of the fossil tunnel with everyone – hope to see you next year! Nick had a blast at Acton Elementary!